I wanted to order some modern Chinese and Indian ships and aircraft from one of the many little projects I am working on. I wanted to purchase the vessels from Navwar but unfortunately Navwar’s only concession to the 21st century is to accept orders by facsimile transmission. Part of the problem is that his fax machine is old and is a phone/fax type. It rings four times before switching to fax for the handshake, connection and eventual receipt of a transmission. The problem is that most modern fax machines give up listening for the handshake at about the third ring. The only other way to buy his products is to physically co to his store in Ilford, England on a Saturday (not too early) or to send him a letter. I am posting this as much for the benefit of my children, one of whom has only ever had the Internet, one can vaguely remember the black and white TV I used to have in the garage and the other two have pretty much grown up in the electronic age. Before electronics, we used to send a letter. Yep, using a pen and paper we would write our order out, enclose it in an envelope, address the envelope and add a stamp of sufficient value to have the letter delivered. 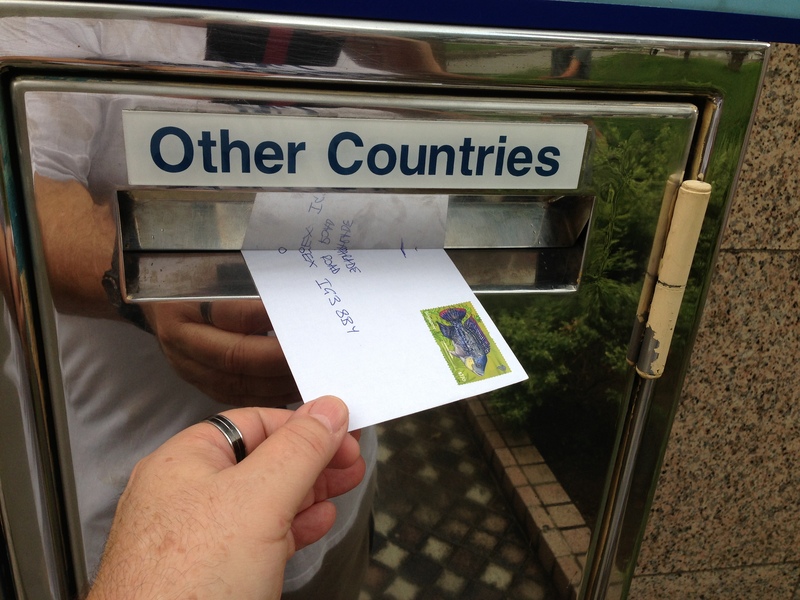 We then tool the letter to the letterbox where we inserted it into the correct slot. Magically, an employee of the Post Office will trot along later today and collect all the letters. They will be taken to the Post Office sorting centre, then this letter will travel on to Changi Airport where it will be placed on an aircraft heading to London. Her Majesty’s Post Office, the Royal Mail, will collect the letter there and deliver it to Navwar. About five days or so should elapse from the time I posted the letter to its delivery. Navwar’s previous order turnaround has always been superb. I have been buying from him for nearly 20 years now and he normally turns orders around in about 24 hours. 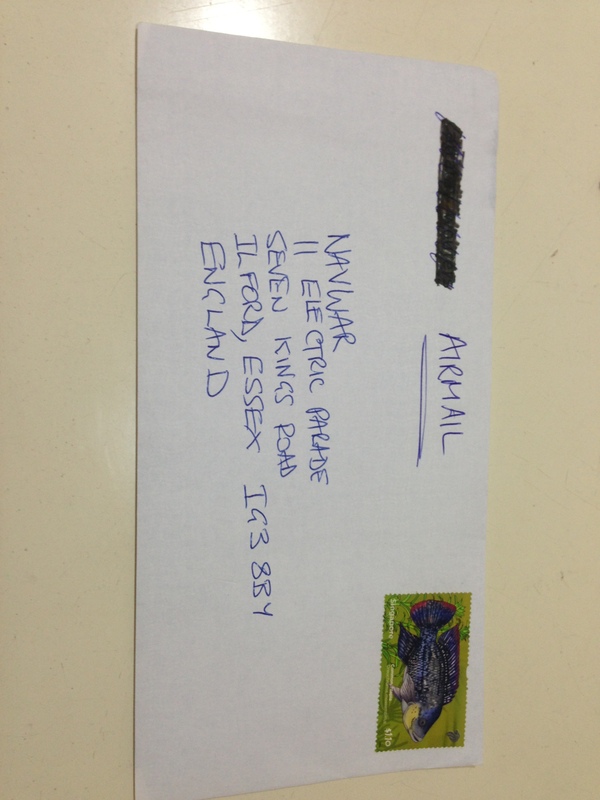 I have ordered by post from Navwar when I lived in Australia, Mongolia, Norway, England and Korea. I have visited the store when I lived in England as well. I expect to have the ships back in about two weeks time judging by his past performance although I just wish he would move forward to 2013, technology-wise. The other thing that is interesting about this is that I am sure that SingPost and the Royal Mail share the revenue from the delivery of this letter.I just don’t know how they keep track of all this and settle at the end. There kids – that’s how we used to undertake long distance communications way before the Internet! Next Article The Decision is In!